TWO Zambia Army officers, a civilian working for Zambia Air Force (ZAF) and a traditional doctor are allegedly behind the spate of ritual murders in which seven people were brutally murdered and their body parts removed. And yesterday, one of the Lusaka Magistrate’s Courts was full to capacity as scores of people jostled to catch a glimpse of the suspected ritual killers who had caused terror and fear among citizens of Lusaka’s Zingalume township. Before Magistrate Greenwell Malumani was Lucky Siame, 46, a Zambia Army soldier of Block 13, ZECO military camp; Elvis Nyanga, 42, soldier of Kandundu Extension in Solwezi; Christopher Kasapo, 44, an office assistant of Zambia Air Force of Zingalume and Lewis Chishimba Bwalya ,41, African doctor of Kalundu, Lusaka West. The quartet, who are facing seven counts of murder, appeared for an explanation of their charges. They told the court that they understood the charges levelled against them but could not take plea as the offence they allegedly committed is only triable by the High Court. Magistrate Malumani told them that they would be appearing for mention as the State awaits instructions from the Director of Public Prosecutions (DPP) to have them prosecuted. Siame, Bwalya, Kasapo and Nyanga are in counts one to seven facing a charge of murder contrary to Section 200 of the Penal Code CAP 87 of the Laws of Zambia. They are accused to have, on dates unknown but between March 5 and 17, allegedly murdered Clever Changwe Mwape, William Chela, Elias Phiri, Boris Muzumara and Alex Zulu. 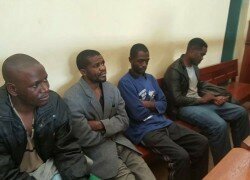 Siame, Bwalya, Kasapo and Nyanga are also alleged to have on dates unknown but between April 7 and 16 murdered Amon Sichamba and Anthony Mwape. And when the matter was called, one of the accused, Siame, told the court that the matter should not proceed as the lawyer he engaged was not before court because he was not aware that he was appearing before court and that his family was equally not aware. But Magistrate Malumani said as far as he was concerned the accused had a constitutional right to engage lawyers but it was not necessary at that stage to have them present because the accused only appeared for an explanation of the charge and not trial. He, however, advised Siame and his co-accused that their lawyers were free to attend court at the next court session when they appear for mention. The matter comes up on May 20 for mention.